Materials and Measurements in Molecular Electronics presents new developments in one of the most promising areas of electronics technology for the 21st century. Conjugated polymers, carbon clusters, and many other new molecular materials have been synthesized or discovered in recent years, and some now are on the threshold of commercial application. In the development of molecular materials, detailed knowledge of the structures and electronic states of molecular aggregates is essential. 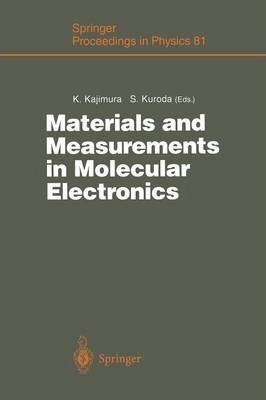 The focus of this book is on the development of new molecular materials and measuring techniques based on modern spectroscopy; included are such topics as Langmuir-Blodgett films, cluster materials, organic conductors, and conjugated electroluminescent polymers. Illustrations note X, 270 p.
I Presymposium Lecture.- Wide-Gap Semiconducting Materials Superior to Silicon.- II Spectroscopy.- Spectroscopy Methods for Low-Dimensional Systems.- Time-Resolved Spectroscopic Studies of Photoexcited Retinal Isomers in Solution and the Mechanism of Photoisomerization.- Structure Determination Using Pulsed ESR.- Electronic and Chemical Structure of Conjugated Polymer Surfaces and Interfaces: A Review and Some New Results.- Microscopic and Anisotropic Dynamics of Spin Carriers with/without Charge.- Optical and Dynamical Properties of One-Dimensional Excitons in Conjugated Polymers.- III Langmuir-Blodgett Films.- Langmuir-Blodgett Micro-Sandwiches.- Control of Electrical and Optical Properties of Langmuir-Blodgett Films Using Photoisomerization of Azobenzene.- Comparative Study on Langmuir-Blodgett Films and Crystals Based on TTF Derivatives with Long Alkyl Chains.- IV Cluster Materials.- Synthesis and Structural Characterization of a Quaternary Zintl Phase Material from the Rb:Ge:In:As System: Rb(Ge1.5In0.5)As2(As1.5Ge0.5).- Electronic Properties of Cluster Crystal Incorporated in Zeolite Crystals.- Conducting Fulleride Polymers.- Development of Superconductors Based on C60.- V Organic Conductors.- Optical Properties of Low-Dimensional Molecular Crystals and Langmuir-Blodgett Films.- ?-d Interaction in Phthalocyanine Conductors.- Low-Dimensional Electronic Systems of Molecular Conductors Under High Magnetic Fields.- VI Conjugated Electroluminescent Polymers.- Electronic Processes Associated with Electroluminescence in Conjugated Polymers.- Polymer LED Utilizing Poly(arylene vinylenes).- Electron-Nuclear Double-Resonance Spectroscopy of Polarons in Conjugated Polymers.- Index of Contributors.